Welcome back to another wonderful Blog Tour with the Creation Station Design Team! It was obvious from the success of our last tour, that you all enjoyed seeing some of the new products from the 2015-2016 Catalogue being showcased, so we’re doing it again! This time, we’re also going to include some inspiration for Father’s Day, which is coming up quickly! On this tour, we have another of our newest members joining us – please give a warm welcome to Dena Rekow!! While we’re very happy to have Dena joining us, we’re very sorry to say goodbye to one of our original members, Jennifer Frost. Can you believe that we started this journey last May, 2014?! It has been wonderful sharing with all of you, and I’m sure you’ll agree that Jennifer has been a wonderful inspiration to us all. Of course, you can always keep following Jennifer on her own blog HERE! If this is your first time joining us, it’s very easy to take the tour! You don’t even need a ticket 🙂 Our blogs are all linked in a circle, so as long as you keep clicking in one direction (either ‘Next’ or ‘Back’) you’ll be taken through all the posts, and see all the amazing project we have made, just for you! 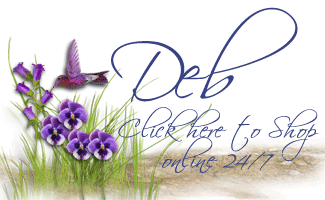 If you’re traveling forward, you’ve probably joined me from the Dena’s blog – didn’t I tell you we were thrilled to have her join our team?! Her projects are great! If you’ve traveled the other direction, then you’ve come from the blog of our fearless leader and amazing talent – Jen Arkfeld! This could be for anyone’s birthday, or switch out the sentiment and you could use it for a Dad who likes cake! This set is the fun Build a Birthday, but I only used 3 of the stamps from this set – the cake plate, the banner and the sentiment. The cake is actually made from strips of the Cherry on Top Designer Series Paper Stack. It’s such bright, fun paper! My card base is Bermuda Bay, then I used the largest of the Ovals Framelits to cut the scallop oval from Watermelon Wonder cardstock. For my image, I cut some Whisper White cardstock using the 2nd largest oval, and stamped the cake plate in Pool Party ink. I attached the strips of DSP using my Glue Stick, and stamped the banner using Watermelon Wonder ink. The sentiment is stamped in Bermuda Bay ink on Whisper White cardstock; I used our new Banner Triple Punch to make the banner ends, then sponged Bermuda Bay ink around the edges using a Sponge Dauber. To finish it off, I added 2 small DSP banners in the top left corner of the card. I was having such fun with this set, I couldn’t stop – so here’s another card! Okay, in truth, the only part of the Build a Birthday stamp set I used was the sentiment! It is stamped in Bermuda Bay ink onto the Whisper White cardstock panel. I started with a card base of Cucumber Crush, then a panel of Whisper White cardstock. Then, instead of using the Cherry on Top DSP like I did in the first card, I used the Cherry on Top Washi Tape! Now this was fun! 🙂 The washi tape has the same patterns & colours as the DSP, and the varying widths are already taken care of for you. I just added the washi tape alternating the patterns and widths in a ‘faux herringbone’ like pattern. 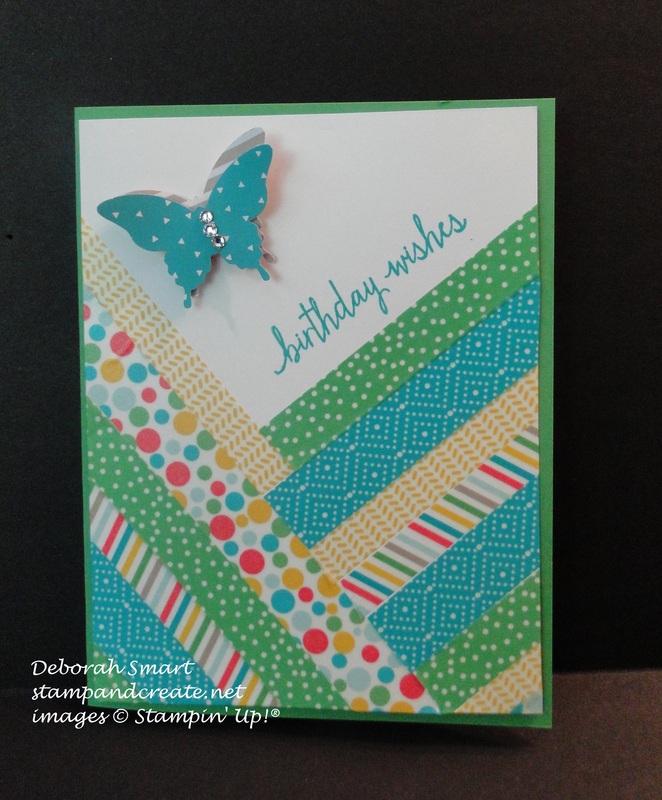 I then stamped the sentiment, and added a couple of layered butterflies, punched using the Elegant Butterfly Punch, from the Cherry on Top DSP stack. I then added a few Rhinestone Basic Jewels in the centre, and I was done! I was inspired by a card that I saw on Pinterest, I think – but I honestly don’t remember where, or who did it; I’ve been seeing so many new projects lately! 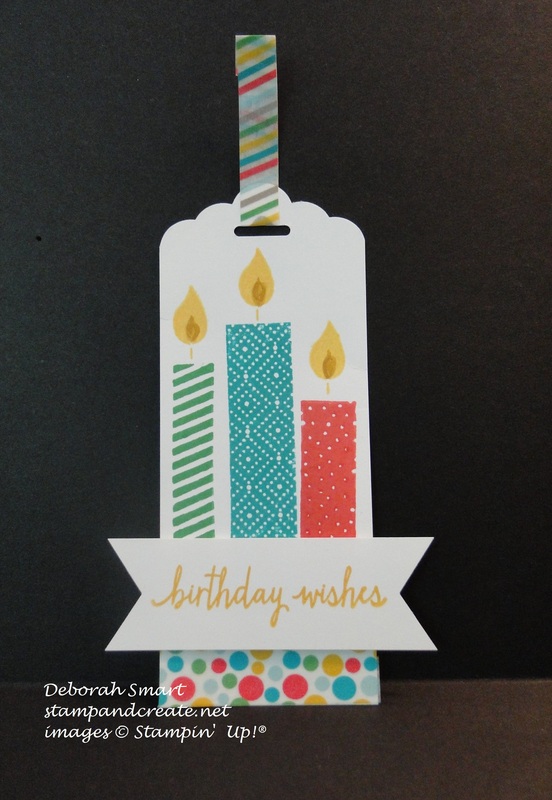 To finish playing with the Build a Birthday, I decided to make a quick gift tag, using our Scallop Tag Topper Punch. I think Bermuda Bay is my new favourite colour! I’ve once again used it as my card base, then added a panel of Crushed Curry cardstock. On top of that, I cut a piece of Cherry on Top DSP into varying widths, and glued them down using a glue stick. The stamp set I used is the Guy Greetings that was originally in the Occasions catalogue (I’m SO happy this stamp set carried over!!). I stamped the tool images 3 times, in Tip Top Taupe ink onto Whisper White cardstock. I used the 1″ Circle Punch to snip off each of the 4 corners, then layered it on top of a panel of Bermuda Bay cardstock. The sentiments were stamped in Bermuda Bay ink onto Whisper White, then layered onto Crushed Curry; each layer was given banner ends using the Banner Triple Punch. **A note about the Banner Triple Punch – although it has guides pre-set for 1″, 1 1/2″ and 2″, you can actually cut any width of paper up to 2″ – because you can see where your paper is feeding to in the open back, as long as you centre it, you’ll get a perfect banner tail! 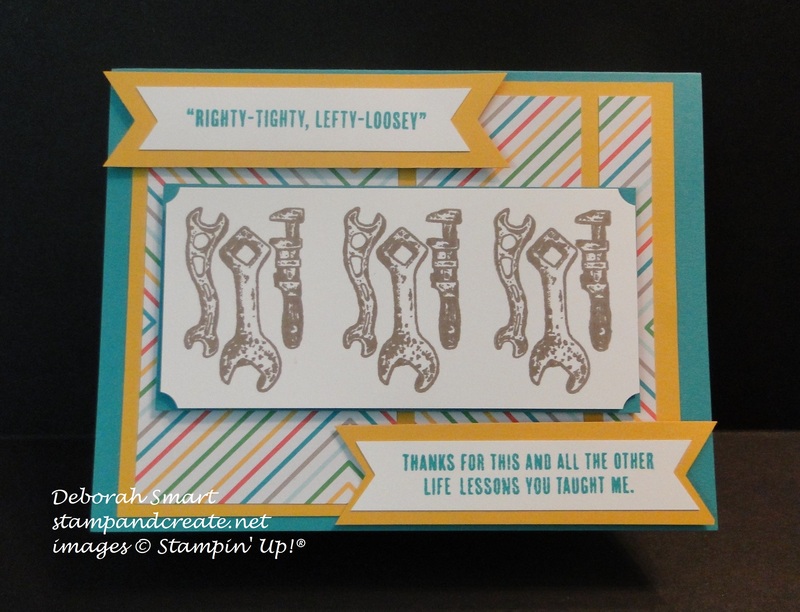 The sentiments and the tool images were all layered using Stampin’ Dimensionals – and there you have a great card for the handy Father in your life! I actually have more projects to share, but I think I should stop now, and let you continue on with the tour! My blog is actually last on the list; unless you didn’t start right at the very beginning. To keep going to Jen Arkfeld’s blog, simply click on the ‘Next’ button below. If you’d like to go back & have another look at Dena’s projects, just click on the ‘Back’ button. Thanks for spending some time with me today, and taking our blog tour! I hope you’ve enjoyed yourself; please leave me a comment is you have the time! If you’d like to order any of the products I’ve used today, you can click on the image(s) below, and you’ll be taken directly to my online store. Great Projects!! Love the new colors and printed papers!! Super cute stuff!! Thanks for your comments, Dena! Glad you liked my projects. Fun bright unisex creations Deb! Wow! You went all out for this blog hop. 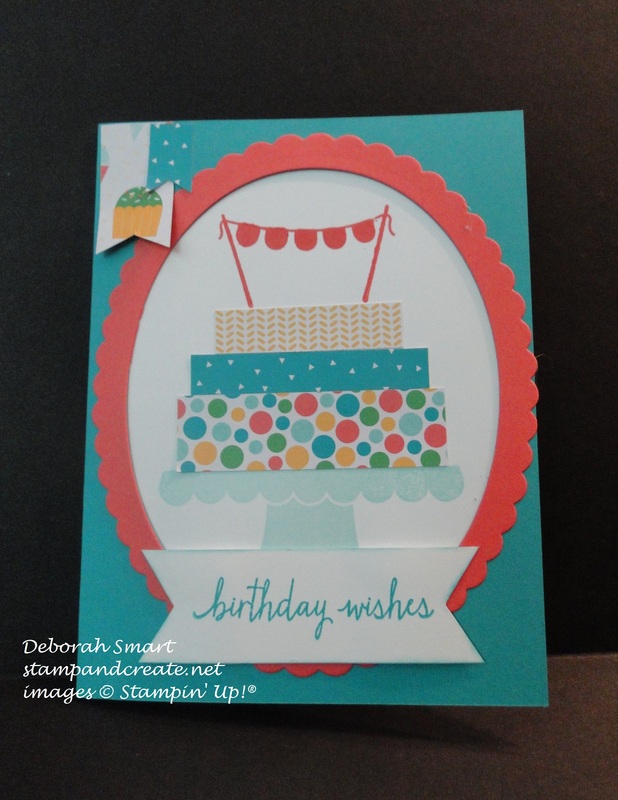 I love these cards and the choice of the “Cherry on Top” DSP is great for this bright and fun birthday cards!